At the centre of MySF Manager is the definition and management of assets. The types of assets that different funds will own vary and require different management. Assets in MySF Manager are divided into financial and physical assets. Typical examples of financial assets include cash, shares and investment funds. Examples of physical assets include real estate, artwork and vehicles. What is common among all funds is the need for visibility and control of all assets at a micro and macro level. To meet this need we added portfolio management capabilities that surpass not only other SMSF software packages, but portfolio management software in general. These include the ability to define your own asset classes, allocation categories, additional input fields and perform exposure (risk) planning and performance analysis better than ever before. MySF Manager runs the asset ledger in parallel with the general ledger (a hierarchical structure of all accounts) to meet the compliance requirements of SMSFs. In fact, MySF Manager is the only SMSF software which automatically gives each asset its own account. Giving each asset its own account is very important because every asset, including every separate parcel of shares bought, has a potentially different acquisition date and therefore may be subject to different CGT discount rules when sold. Lumping all shares under a single code into one account and attempting to average out the cost among different units (as most other products do) is error prone, not compliant with ATO examples and guidelines and may leave you with incorrect CGT calculations. The addition of assets in MySF Manager is easy and fast. There are custom built screens for financial and physical assets which guide you through recording information about each purchase or dividend reinvestment. MySF Manager will create the asset record in the asset ledger and the account for this asset in the general ledger whenever a new asset is added. 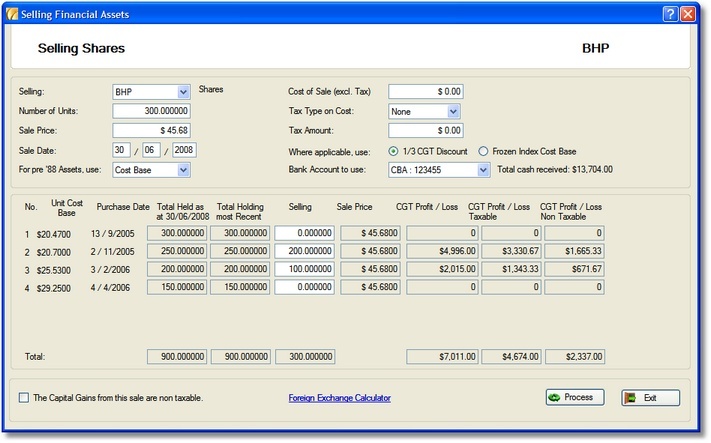 If you are recording this addition for the current financial year of your fund then the software will also create and post a transaction to record the accounting effects of the purchase. In the case of additions from previous financial years, MySF Manager will assist you in creating an opening balance for the account. As mentioned earlier, each asset has its own account in the general ledger. These accounts hold the cost base of the asset. Any changes in market value which need to be recognised on the balance sheet are posted to the “increase in market value” accounts. MySF Manager provides you with the asset and portfolio management tools that are needed to deliver complete control and visibility of your investments. Some of these features, such as analysis, are important for your management of assets. Others, such as the separation of share parcels is vital for compliance and accurate tax calculations. Individual assets can be segregated to any selected member. MySF Manager’s attachments functionality can be seen throughout the software and this includes the asset management and sales screens. You can attach electronic documents to most events, which will save you time and ensure that you can quickly and easily find whatever is needed. MySF Manager includes a full set of screens dedicated to the processing events that may affect your fund and its financial assets. These screens enable you to process purchases, dividend and distribution reinvestments, dividend and distribution receipts, splits, consolidations, demergers, bonus unit issues and capital repayments. In addition to ensuring accuracy, these screens enable you to save time and the hassle of manual calculations behind what are often very complicated corporate actions. MySF Manager keeps a separate record for each parcel of shares that you own, so you can be certain that the handling of tax deferred income, market value change and capital gains calculations are accurate. MySF Manager is also flexible and allows you to customise the program for the types of investments that you own. For example, you may wish to separate “International Shares” into “Shares - US” and “Shares – Europe” for improved analysis or simply add a few assets that are not included in the typical portfolio. Please see the section of this tour for more information related to portfolio management features. It is vital to be able to revalue your assets for any date at any time. Having a full set of revaluations for a range of dates enables you to see not just how much your portfolio is worth, but also how its value has changed over time. MySF Manager is the only SMSF software package available which can automatically revalue all listed assets without the need to purchase a separate data feed at additional cost. MySF Manager’s revaluation mechanism is truly automated and receives data on demand. In most cases you can revalue a portfolio of shares for every day of a year in less than 30 seconds. You can also process revaluations manually for assets where data is not available (such as commercial property) or override the automated revaluation if needed. MySF Manager contains features which enable you to better manage every aspect of your investments in physical assets. Each physical asset defined in MySF Manager can have a depreciation schedule attached (in standard ATO format). The entries in the schedule will be the individual items which make up the main asset. As an example, for a commercial property we would record the shell of the building as one item (life of 40 years) carpets as another item, fittings as another etc. Each item would have a different ‘useful life’ term and therefore a different depreciation rate. 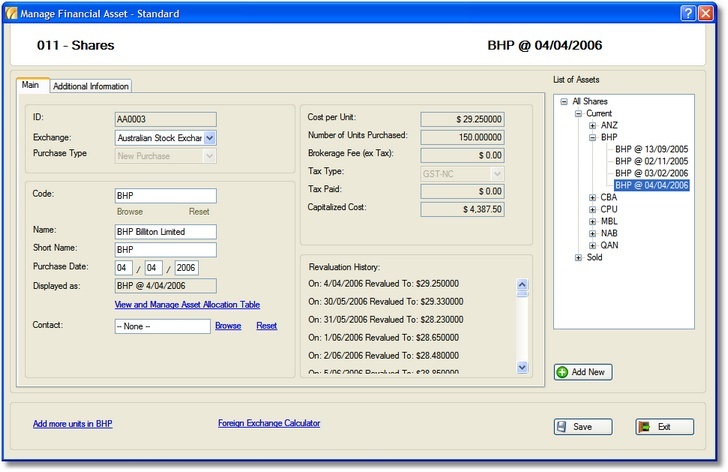 Depreciation processing can be performed on via a dedicated screen. You only need to enter the date to which you wish to depreciate the asset and MySF Manager will do the rest. You can also include improvements to a specific asset and link the improvement to the base asset. The improvements can also have a separate depreciation schedule. Improvements are held as a separate asset record and can be detached from assets or attached to other assets quickly and easily. You can record insurance and any property management details for your physical assets in MySF Manager, with an option to add a reminder for policy renewal. 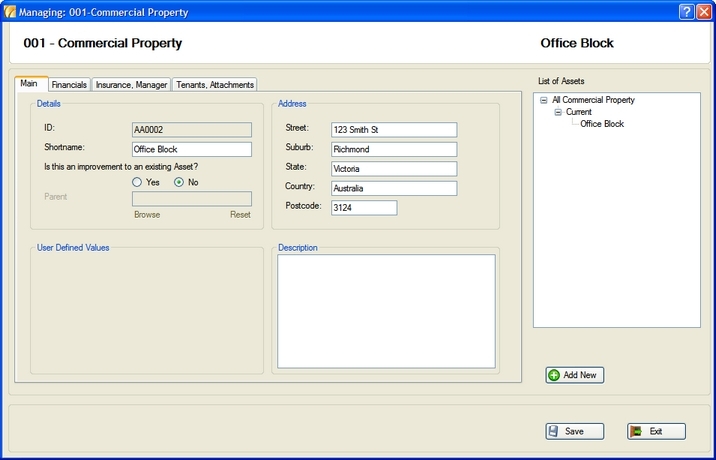 MySF Manager enables you to add tenants and rental details to any of your physical assets. This means that all information for the asset can be in one place and you can quickly view or update details. MySF Manager also caters for 'tenants in common' (joint ownership) on any Physical Asset. In addition to the standard input fields in MySF Manager you can create ‘user defined’ input fields. These fields can be tailored to meet your needs. For example, if you own commercial property you may wish to record the square metres, type of construction, builders name, local council and number of car parks. For Artworks, you would probably want to record information such as artist, size, date painted. MySF Manager allows you to setup what it is you wish to record for a specific asset class, and these values will display on all screens throughout the system. Recognising the difference between the market value and cost base of an asset is critical. Neglecting to recognise this difference is also a common problem in SMSF software. The market value of an asset is the value placed on it at any time by the market. In contrast, the cost base of an asset is what you had paid for it (including any acquisition costs such as brokerage), less any amounts recovered. For example, if you bought 1000 units of a share for $10 some years ago (assume no brokerage), have not sold any of them and have not received any tax deferred income, then the balance of that asset’s account will be $10,000. Importantly, this is the case regardless of what those shares are worth today! If you had received $1 per unit of tax deferred income as a capital repayment or as the tax deferred component of a distribution then the cost base of the asset would be $9 per unit, making the balance of the asset’s account $9,000. Any accumulated changes in market value which must be recognised in the balance sheet at the end of the financial year appear under the “increase in market value account”. Capital gains are calculated from the cost base of an asset. If you were to sell all of the shares mentioned above for say $12 per unit, then you would get (($12-$10) x 1,000 =) $2,000 of capital gain if you did not receive tax deferred income and (($13-$10) x 1,000 =) $3,000 if you sold it after receiving $1per unit of tax deferred income. In addition to capital repayments and tax deferred components of distributions other events which may also lead to a change in either the quantity of shares owned or their cost base. These events include: share splits, consolidations, demergers and bonus unit issues. Most SMSF software and indeed most portfolio management software solutions fall short of recognising the difference described above by lumping all shares with one code together or posting changes in market value to the asset’s account rather than the increase in market value account. This means that they are sometimes unable to differentiate between units affected by cost base changes and those that are unaffected. They may also not associate particular units with the correct acquisition date. That problem in turn leads to incorrect capital gains (and associated tax) calculations. MySF Manager handles asset revaluations separately from the accounting side of asset management. Lists of revaluation dates and values are attached to each asset, but no entry is made to accounts until year end. At year end the increase in market value for the current period must be recognised as an asset in itself as required by the ATO. This means that you can use the software as a portfolio manager while knowing that it will also perform tax related calculations in accordance with applicable rules. When you elect to sell shares or other financial assets in MySF Manager you will be presented with a screen to enter the details of the sale. You will be shown each of your holdings in the selected share code (or other asset) along with the cost base and purchase date of each parcel. You can then nominate how many units of each holding you wish to sell. As you enter these numbers MySF Manager will continuously update the screen to show you what your capital gains would be and what proportion of those gains would be taxable if you proceed with the selection entered. This allows you to select the exact units which you wish to sell and see the consequences of the sale, as a kind of what-if analysis. When you decide to proceed with the sale MySF Manager will make all capital gains calculations and post the transaction to record the accounting effects of the sale. Some SMSF software packages provide an option to automatically assign sales of units on a first-in-first-out (FIFO) and last-in-first-out (LIFO) basis or perform some behind the scenes CGT optimisation. Both FIFO and LIFO are intuitively simple, especially for programmers. These approaches are also not particularly useful when it comes to optimising asset sales. The amount of capital gain and how much tax you pay is determined not only by the date on which you purchased the asset but also its cost base (see “Market values versus cost base”) so neither FIFO nor LIFO can provide you with real optimisation by ordering assets based solely on duration of ownership. Other mechanisms can include choices to maximise profit, minimise tax or just plain “optimise”. These mechanisms also tend to hide from you the detail of which units are being sold and from which parcel. Software has no way of anticipating what is actually optimal for you so such optimisation is likely to be a guess at best. Additionally, you often have no way of checking whether or not the result is actually the best possible (i.e. least tax, max loss, max profit etc.) because you cannot see what has happened and why. In contrast, MySF Manager shows you how many units you are selling from each parcel and the exact capital gains tax breakdowns before the sale is processed so that you can identify the optimal solution. This is part of providing you with the visibility that you only get from MySF Manager.